Numbers were down slightly on our last meeting, but a fine afternoon saw the following present: Michael Bankovski, Ron Bassee, Bruce Beatty, John Brand, Chris Comer, Bill Davis, David Denner, David Doddrell, Bruce Douglas, Peter During, David & Margaret Goss, Roger and Sandra Hall, Neville Handcock, Bill and Margaret Inglis, Reece and Chris Isaac, Nigel Jolley, Graham Jost, Arthur Kirkbright, Mike Maloney, Rod Marrow, John Martin, Barry McDonald, Mark Mason, Kimball Monger, Jim Osborne, Tony Press, John Riley, Graham Russell, Patrick Russell-Young, Graeme Thomson, Bruce Thompson, Doug Ward and Allan Weaver. Apologies were received from Bill Fitzgerald, Steve Hatton, Paul Johnstone, Wal Maynard, Jack and Carol Parsisson and Mike Wright. After a rather hectic first hour - talking and fraternising, setting up models for display and with just a little wheeling and dealing - and as foreshadowed in our last Newsletter our Vice President, Jim Osborne, ran this meeting and called us all to order at 2.00 pm. He welcomed one visitor, Laurie Allen, who had recently bought a set for his grandson, but now - well - perhaps Grandpa might be taking a closer interest in Meccano! Laurie is now our latest MMC Inc. member. Later in proceedings we also welcomed Patrick Broxham, a UK Meccanoman who is presently resident in Bangkok but is visiting family in Melbourne. Kimball, as Chairman of our 2002 Exhibition Committee has been busy thinking about what we can do to smarten up this year's exhibition. He has proposed that we should include a display of manual models from all sets - from No 1 to No 10. 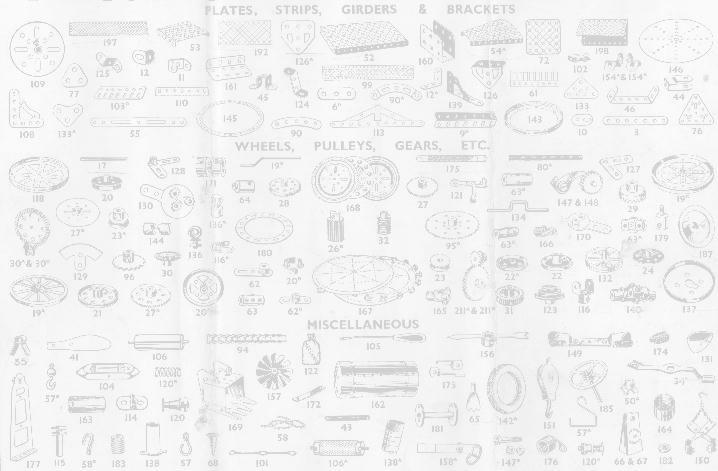 Bruce Thompson has already agreed to provide models from sets 1 to 5, then Peter During offered to deal with sets 7 and 8, John Riley set 9, leaving models from sets 6 and 10 required. Discussion was quite animated and enthusiastic towards this proposal, and in no time the idea of the same thing for the different colour periods was also suggested. We actually have two extant No 10 set models - Jack Parsisson's Trench Digger and Paul Johnstone's Mobile Workshop. Those who wish to contribute to the display should contact Kimball so that he can plan and organise the display to advantage in due course. Graham forgot to mention that we had a very successful two-day stand at the Berwick Show on February 23 and 24. Kimball Monger had organised that, and he, Dave Denner and Graham Jost participated in it. It was an interesting experience - the Berwick Show must be one of the more thriving of such events. Certainly just about everything that can be seen or sampled at the Melbourne Show was to be found there, albeit on a smaller scale. Graham then called on Kimball to report on the Scoresby Steamfest on March 9, 10 and 11. Those exhibiting were Kimball Monger, Dave Denner, Carol Parsisson, Jack Parsisson, Patrick Russell-Young, Sandra Hall and Roger Hall. This was vastly more successful than last year, a major reason being that this year we could be readily seen by the passing parade - last year a large food van was parked right in front of, and rather blocking, the entrance to our venue. The weather was kinder too, being much milder than that of the past two years at this time. Presumably as a result of both factors, our visitor crowds were very much greater than last year - and right to the very end of the final day, too. Robin Schoolar was a very welcome UK visitor, and evidently thoroughly enjoyed his time there. All in all, a most satisfactory exhibition, and one for which we feel a further invitation will be forthcoming for next year. We have also been invited to participate again in the Model Engineering Exhibition to be held in the Engineering Halls at Monash University just a week before our own - on the weekend of October 5 and 6, 2002. Please let Jack know if you wish to be part of this one. Graham also reminded those present of the Sydney MMA Exhibition on April 27. Jack and Carol Parsisson and also Dave Denner will be attending that. Before going around the table, Jim paid particular tribute to the two Margarets - Margaret Goss and Margaret Inglis, who had kindly offered at zero notice to help with afternoon tea on this day. They did a sterling job, too. Many thanks to you both. Rod Marrow brought along the 2002 Meccano catalogue, obtained from the recent (wholesale) Toy Fair, at which Meccano evidently had quite a substantial showing. Unfortunately Paul Johnstone, who usually attends this, was not present to inform us further. Bruce Douglas reminded us that tomorrow, April 15, 2002 is the 550th anniversary of the birth of Leonardo da Vinci. The city Savage Club is celebrating the event, and Bruce will be attending, taking along some suitable mechanical models provided by Jack Parsisson, Tony Press and Graham Jost. We hope they helped to raise the tone of the occasion, Bruce, and that they did not let you down when it came to demonstrating same! Bill Davis was disappointed that Carol Parsisson was not present. At our last meeting Carol had issued a challenge - that she would continue to show up those members who failed to produce models by doing so herself! Well Bill had responded by bringing a lovely model of a 1920s wharf-side crane, one of those simple but elegant constructions with which the onlooker can immediately identify, and understand the workings. Well done, Bill - wonder how Carol will react to this? Graham Jost circulated information and samples from Exacto in Argentina. Exacto parts leave nothing to be desired concerning their quality, but are a fraction expensive for us, being priced in US dollars. Graham has all the information should any member wish to place an order. At this point Jim explained that we would now break for half an hour or so, to permit detailed examination of the several models present, and during which time trading would cease. He asked that their builders be available to answer any questions. This worked well, and also permitted your scribe to take some notes which would otherwise surely not have been the case. During this time also, two videos were shown, one of Dave Denner's Tricky-Track at the Scoresby steamfest, and one brought along by Graham featuring contributors and models at a Centenary Exhibition held in September last year in the UK. Judging by the wrapt attention, these two were of more than passing interest! A specials thanks to Roger Hall for bringing along the wherewithal for us to enjoy these, namely his video player and monitor. Christopher Isaac, aged 9, had two lovely models on show. They were the Crazy Inventors Helicopter and a Future Masters tracked tunnel borer. His Dad, Reece, says that Chris did 99% of the building. Well done, Chris - you're well ahead of Dad on this occasion! Peter During brought along three models, a 1970s No 3 set Wharf Crane which looked and worked beautifully, a 1950s Horseless Carriage and a 1979 No 5 Meccanograph, all in blue/yellow/zinc. A nice group, Peter. He also reminded us that he would be swimming in the forthcoming World Masters swimming competition. Well done, Peter - we wish you every success. John Riley has previously exhibited his No 10 set Front End Loader. He was in the process of demolishing it recently when he decided that its robust chassis could be usefully reincarnated to form part of a rather nice dune buggy. This looks good, John - now get it finished to perfection for our October expo, won't you? 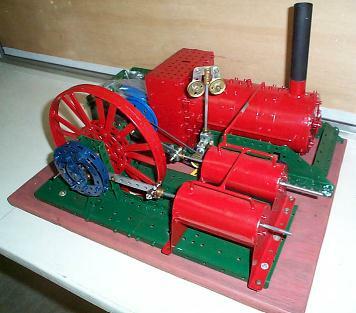 Jim Osborne showed a lovely build of the robust roller bearing featured in Bert Love's "Model Building in Meccano". A very fine unit, Jim, and running like a clock, but do I detect some KG Ring Frames of non-standard diameter and - er - a remarkably long (JP?) 11/2" Flexible Plate forming part of the circular base? Michael Bankovski brought along two models, a motor-bike and a front end digger. Both are motorised, both work as they should, and both are a real credit to you, Michael. From the modern purple set - the 40 model set I believe it is. Mike Maloney showed his March 1997 CQ Tip Truck by Bernard Perier. 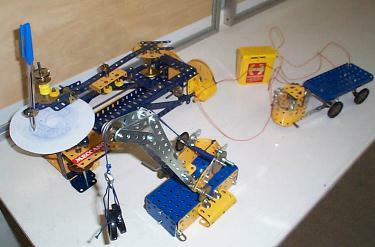 This chap specialises in small-scale Meccano modelling including all the usual essential actions and mechanisms. Mike is enjoying building this model, but says he is finding it "challenging". What with fitting things into impossible spaces, I think I can see what you mean, Mike! 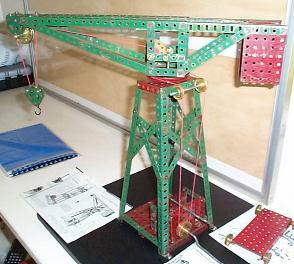 Bill Davis' model has already been referred to - a very neat crane from the 1927 manual, No 407. This worked beautifully and looked a treat. 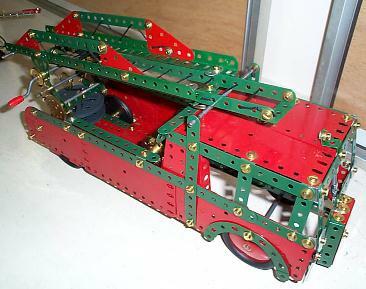 This burgundy/bottle green period is one of my favourite Meccano colour schemes. 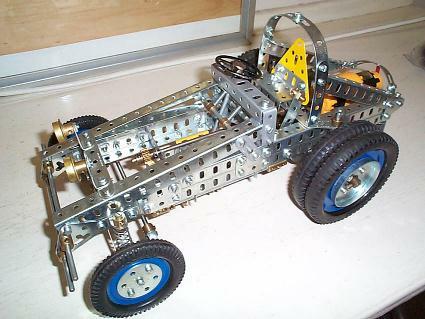 Ron Bassee had two models, both of his own design, and using parts yet to be seen as part of the Meccano system! 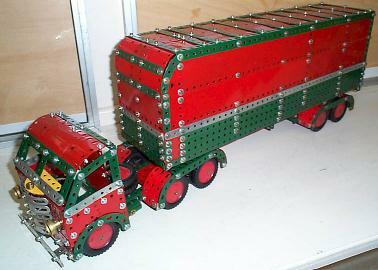 A steam engine and associated plant, and a covered semi-trailer unit were both in red/green, and they looked the part most effectively. 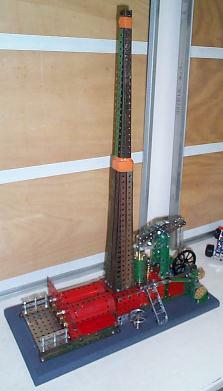 Kimball Monger had a new beam engine model - at least I hadn't seen it before! Very smooth, silent (as these things always were in fact) turning over nicely at the right speed, and driven by no less than a five-stage belt/band reduction drive, so Kimball pointed out. Even the Lancashire boiler was properly represented, along with an imposing smokestack. He also had a large-scale Steel-Tec speedway mini-sprinter model. This system uses 6 mm holes and parts a little wider than 1/2". It's an interesting system, and I hadn't seen it before. 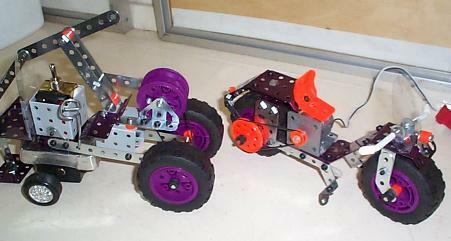 Sandra Hall showed two models, the motorised Dinosaur and the Pusher-plane from the No 3 Evolution set. Very neat, Sandra, and just the thing as part of our expo display in October! 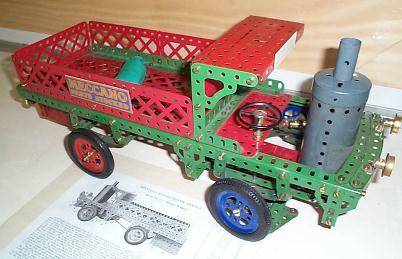 Roger Hall showed a No 5 red/green set Fire-engine using his immaculately restored parts. Another perfect model - I marvel that Roger can actually use these parts in modelling, and thereby risk scratching them! David Goss had his Crazy Inventors Airship on show. This is a fine model, and probably the most popular of this series. 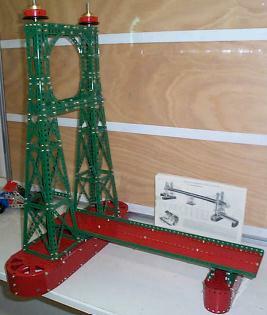 Barry McDonald had one tower and its approach road of the No 10 set model 10.17, the Transporter Bridge. He is planning on having this one at our exhibition, and a fine sight it will be, too. 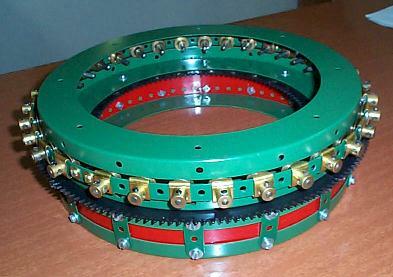 All in red/green, using Braced Girders in place of the Strip Plates shown and motorised so that the carriage runs to and from continuously. Can I suggest you include a delay mechanism at each end Barry - to allow time for loading/unloading? This will be a beauty, and something like seven feet long when complete. I am pleased to announce that the first meeting of the Alice Springs Branch of the MMC Inc. was held on Saturday 17-3-02. I am also pleased to say that all the branch members were in attendance - it was a full house. Those present were the President/Secretary Vern Ellis and Treasurer Christel Elis. The meeting opened with the President announcing that all their Meccano had survived the move from Victoria to the Northern Territory. It was all in one piece so to speak. The President then informed the other member present that he had purchased a set 6 Techno and a Set 6 Evolution in Alice Springs at a very good price - both in mint condition but not boxed. The Treasurer then announced that the branch funds were "way in front" and that the branch should pay for the above sets and shows its appreciation for all the work the President had put into the Branch since arriving in Alice Springs. A vote was taken and the motion was passed. A discussion was then held and it was decided that the Secretary would contact all the other Northern Territory MMC Inc. members and find out their interests in Meccano. Our Club contributed to a spectacular celebration dinner held at the Melbourne Savage Club on 15 April 2002, to commemorate the 550th anniversary of the birth of Leonardo da Vinci. Leonardo was probably the greatest "Renaissance Man", as an artist, anatomist, inventor and engineer, among his many achievements. The Savage Club is an exclusive gentlemen's club located in Bank Place, Melbourne. Its members have always been more "bohemian" than the members of other more staid City clubs. 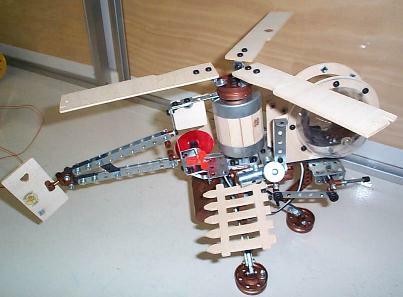 Savage Club member Peter Jones had visited our MMC exhibition in 2001, and asked me if our members could loan some models to represent Leonardo's remarkable range of prophetic engineering inventions. A display was set up in the Club's billiard room, and I brought models kindly loaned by our members. David Goss' Crazy Inventor's Airship and Jack Parsisson's Fowler traction engine performed flawlessly, and various hands-on mechanical demonstration models by Graham Jost and Jack were of great interest, with much handle-turning. The Italian-inspired black-tie dinner was interspersed with guest speakers, interviews with Leonardo and his father, a juggler, and a live telephone hook-up to Italy with the Mayor of Vinci, where celebrations continue. A great promotion for our Club. Several guests commented that the models showed what Leonardo would have designed, if he had a Meccano set !! !